Writing good poetry begins with reading good poetry, which can take hours to collect. This is time a busy teacher only finds after all the other tasks of teaching are completed. But Gynzy just created a tool that you can use no matter what age group you are teaching, what time of year it is or what theme you are studying. The Poetry / Prose Library can be personalized instantly so you have the precise quality public domain poems you need at your fingertips. I feel a sonnet coming on! The lesson Different Types of Poetry illustrates the differences between sonnets, ballads, limericks, Haiku, odes and elegies. Teach the difference between a Petrarchan or Shakespearean sonnet with this ready to go lesson. 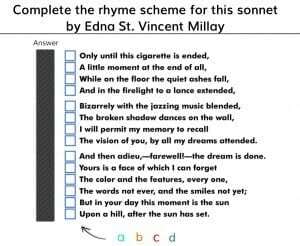 Bring a chuckle through listening together to the humorous poem, The Cremation of Sam McGee, one of my favorites, and marking the rhyme scheme of a Sonnet by Edna St. Vincent Millay. Listen to Tyne Daly recite this one on YouTube to hear it in all its depth. 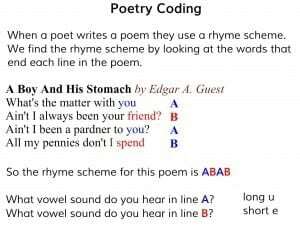 I enjoyed writing the lesson Poetry Coding. It teaches students to look for rhyming patterns, to practice rhyming words and to count syllables in lines. It has the Poetry Library tucked inside so your students can have lots of practice coding and then craft their own couplets and quatrains. It can be used with grades 1-5 because the library is customizable for any grade. 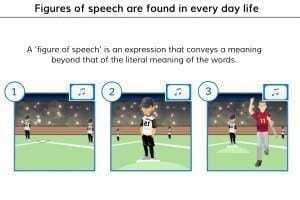 The lesson, Figures of Speech, will encourage good listening skills and recognition of similes, metaphors, personification, hyperbole, or allusions accurately. It includes a detailed quiz at the end to let you know what you need to re-teach, as well. The lesson on Imagery can help students formulate more vivid images by using their five senses and word choices that convey stronger emotion. We’re all growing in the craft of writing and this lesson can provide practical help on the journey. Since its springtime, it’s a perfect time to write Haiku Poems. The insects are jumping and the flowers are blossoming. 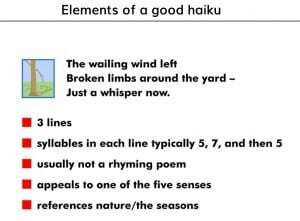 This lesson is helpful in crafting the form and style of a Haiku. Define the 575 syllable pattern, but also include the “kerigi” (cutting word) and how to make the Haiku stronger using, again, the five senses. So everyone can celebrate Poetry Month! Use the helpful category selection under Language Arts to find all the poetry resources quickly. I love thee with the passion put to use!